There is a difference between obvious subjects and those we have to search for. Obvious subjects might be a dramatic sunset, a lit fountain at night, the Eiffel Tower at anytime of the year or a zebra driving a jeep down the high street – these are things you couldn’t resist taking a picture of. Less obvious subjects only appear when you take time to be observant and have your eyes open to patterns, shapes and tones. Sometimes it’s difficult to explain exactly what it is you are photographing, but you can see there is a picture there all the same. And often it is only when you have the time to sit and study the picture after you have taken it that you begin to understand what it was that you saw in the first place. The great thing about the less obvious picture is that fewer people see them, and so fewer people take them – so you picture will stand out as being different. 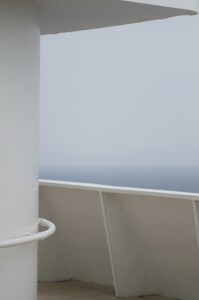 This picture was taken on an overcast day on a ship far out at sea. 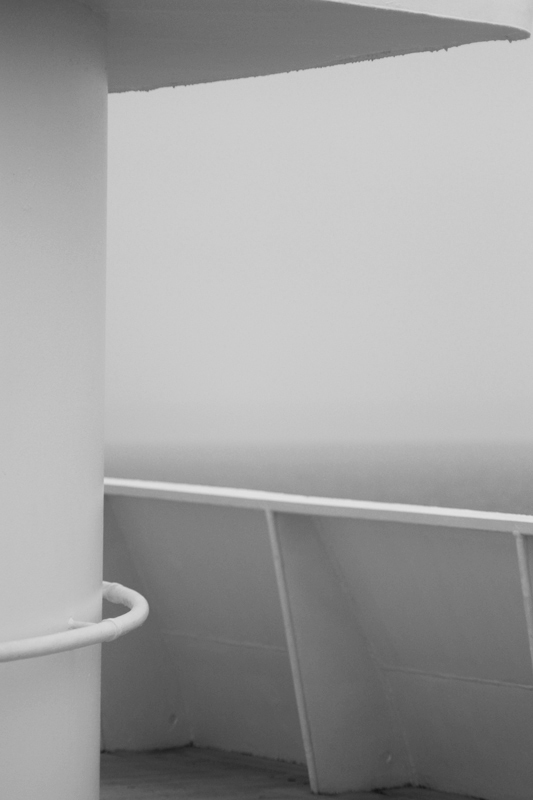 Walking the decks with my camera in my hand the obvious thing to do was to look outwards to see what was out at sea. But as the answer was ‘nothing’, the only thing to do was to photograph the ship itself. Ships, especially old ones like the QE2, are beautiful to look at. They have wonderful smooth curves and endless lines of rivets, panels, handrails and planking. In the low contrast light of the clouded sky the shapes of the ship were revealed in lightly graduated tones, as moderate shadow slipped into moderate highlight and all the details were carefully preserved. Shooting a white subject on a white day can create some exposure difficulties. If you let the camera make all the exposure choices you’ll end up with an image that is just too dark and dull. The camera’s meter will only see a very bright scene and will recommend buttoning down the aperture to ensure things don’t appear too bright. The camera doesn’t know of course that you want the subject to appear bright – it is white after all, so you have to take a little control to add brightness. On this occasion I only had to shift the exposure by about 1/2EV. Using the exposure compensation mode I dialled in +1/2EV – but you can as easily do this in manual exposure mode and open the aperture to over expose by ½ a stop. A scene like this, which relies on its simplicity, requires that you allow the viewer to appreciate the shapes and tones unhindered by distractions. Firstly make sure that are no annoying, eye grabbing, objects in the scene – a cigarette end, a bit of litter or a person for example. Next, make sure you are not creating any visual distractions, such as sloping horizons, converging verticals and lines that are simply not level. You can’t just point and shoot; there needs to be a few moments devoted to ensuring the camera is straight and level. This doesn’t take much effort, but it will make the difference between a pleasing shot and one that does not convey your message. The key to the success of this image is its simplicity, soft contrast, neutral muted colours and smooth tonality. So long as the white balance – I shot this on the ‘daylight’ setting – was about right in-camera there shouldn’t be too much you’ll need to do to the picture in software. I opened this frame and looked for a while, itching to do something to it. I tried a few things and messed about a bit before I realised that what I really needed to do was to leave it alone. So, I did. Pentax K10D, smc Pentax DA-70mm f/2.4 limited edition lens at f/2.4 and 1/2000sec, ISO 400.